The UK’s van operators are battling loneliness by taking their dogs on the road with them for company, with more than 200 000 van drivers hosting canine companions on any given day. According to the Mercedes-Benz Vans Business Barometer, which monitors the opinions on more than 2 000 van drivers and owners, life on the road can be a lonely place for Great Britain’s professional drivers, with the average driver spending over 17 hours completely alone and over a third (35%) spending at least 20 hours in solitude. So with mental health and driver well-being taking more of a focus than ever before, drivers are turning to the 'Van Man’s Best Friend' to raise their spirits, with one in five agreeing that their dogs have had a direct positive impact on their mental health. Over half (52%) of van operators who bring their dogs with them their vehicle say they do it simply because it makes them feel happier. Those who take their dogs with them throughout their workdays say they feel much happier (52%) and more relaxed (45%). A third (33%) say their dog simply helps them get through their day, and over half (53%) said having their dogs with them has actually assisted in winning new business. 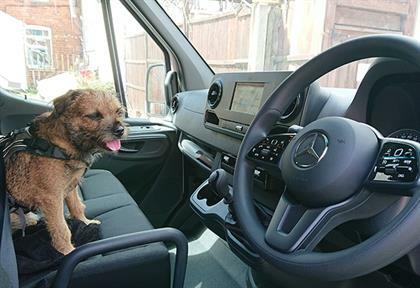 "It’s great that our canine friends can join the nation’s hard-working van operators in the vehicles, providing much-needed company along the way," says Steve Bridge, Managing Director, Mercedes-Benz Vans UK Ltd.
"However, it is also important to remember that dogs need to be suitably restrained according to the Highway Code, so a seat belt harness would be a good investment to ensure that both the driver and the dog are safe and secure," Bridge added. "I wish I could take Gilbert, my Westie, to work with me!" The Mercedes-Benz Vans Business Barometer is a nationwide quarterly survey of 2 000 businesses large and small, created to help us understand the economic landscape and discover what van owners and drivers need to keep their business moving.